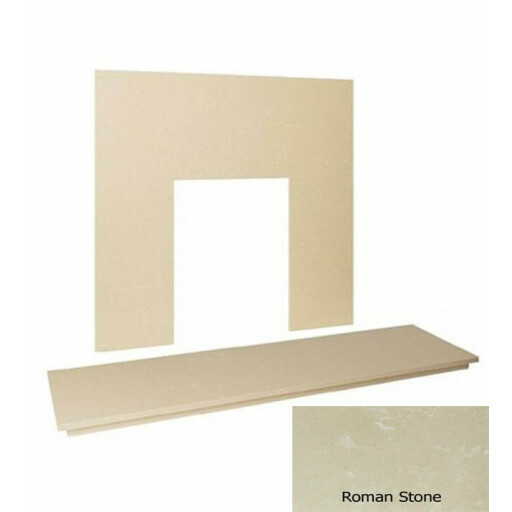 This marble hearth and back panel set will lend a classic look to your home's fireplace. The 'Roman Stone' colour effortlessly complements any décor, bringing warmth and elegance to traditional and modern rooms alike. Made of the highest quality materials, this hearth and back panel set is the perfect choice for discerning customers who value both workmanship and appearance. The set is equally at home in a lively family living room, a professional study, or a quiet den. The hearth measures 54" x 15", and the back panel measures 37" x 37" with a standard-sized (16" x 22") cut-out, made to fit most gas or electric fires. A solid back panel with no cut-out is available for an extra charge. Brighten up your fireplace with this simple, elegant hearth and back panel, and add a special, personal touch to whichever room of your house it graces. The hearth and back panel set if perfect for rooms that require a little extra dash of brightness. This product is also available in a variety of other colours to suit the colour scheme of any room.